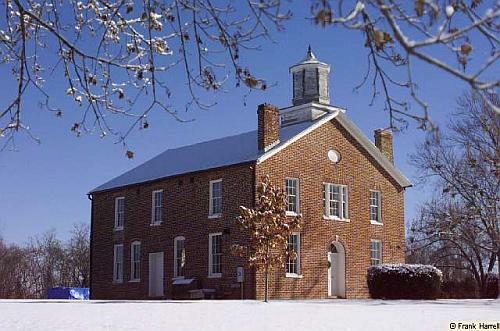 The restoration and preservation of the Brentsville Historic Centre is a project administered by a unique partnership among the Prince William County Government, the Prince William County Park Authority and our citizens' group the Friends of Brentsville Courthouse Historic Centre, Inc. This partnership is called the Brentsville Historic Trust. The Brentsville Historic Centre Trust meets once a month to provide oversight numerous ongoing restoration projects, archaeological digs and to administer various local and federal grants to fund the project for this 24 acre site. The Brentsville Historic Trust has benefited from grants received from the Virginia General Assembly, federal funds received through two TEA-21 grants. The Trust was also bestowed an individual anonymous donation of $10,000. In addition, The Friends of Brentsville Courthouse Historic Centre, Inc. a non-profit, volunteer organization and The Manassas Museum System also received a grant for $10,000 from the Prince William County Tourism and Visitors Center Bureau to promote our 1st EVER Civil War Living History Event in July 2000, to help raise public awareness and support for the restoration of these enduring buildings. On May 19th, 2004 the partners of the Trust – representatives from the Pr. Wm. Co. Historic Commission, the Pr. Wm. Co. Park Authority, the Pr. Wm. Co. Executive, the Pr. Wm. County Manager of Historic Properties, Friends delegates to the Trust, and the Brentsville Community Representative to the Trust, met to discuss the challenges which face the Trust as it reworks its Memorandum of Understanding between the Trust Partners. In an effort to strengthen our relationship with the other partners of the Trust, the Friends commit to renew their efforts to ensure continued success of the project. The product of these efforts will be a Strategic Plan which establishes long and short term goals from now until the completion of the currently funded renovations of the Centre in 2006. This plan will serve as a document that recognizes the concerns and efforts of the Friends, the Friends Partners, and the Brentsville Community whichcontinue to ensure that the site acts as a community resource for education, historical research, and the appreciation of history. Upon completion, this strategic plan will be submitted to the Trust, so that all parties involved in the restoration and preservation of the Brentsville site are aware of the Friends goals and are constantly working towards a viable, active, historic centre on the Courthouse grounds. The success of this effort depends on input fromall members of the Friends. Please discuss the project with your neighbors and any interested parties and inform the board of your opinions in an effort to ensure that the Plan is an accurate representation of the Friends goals. On Saturday June 12, 2004, the Friends welcomed members of Historic Prince William to the Centre grounds for HPW’s annual box social. Mr. Don Wilson of the Prince William Library was present with displays regarding the RELIC room, Prince William County’s premier research resource. The Archaeological Students of Hylton High, and their instructor Ms. Robin Meyerling, displayed their explorer kits and aided the Friends in the presentation of a walking tour of Brentsville Landmarks. At this event, the Friends and Hylton High School formally executed and renewed their partnership in order to ensure that the Centrecontinue to play an active role as an educational resource within the Prince William County Schools. Special thanks should go to Ms. Betty Machen whocontinues to provide the Prince William County students with the opportunity to perform hands-on archaeological investigations within historic Brentsville.